A. 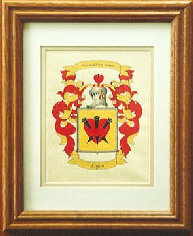 FAMILY NAME ARMORIAL w/COAT OF ARMS & HISTORY $19.95 11"x17" (shown framed in Barnwood). The colorful Coast-of-Arms coupled with the Family Surname History will bring many compliments. Together they create a wonderful showpiece of the story of your surname and its origins. This beautiful parchment tells the legends and the facts of how your people came to be. Notibles and early emigrants are detailed along with the impact of your kin on the world around us. Heraldic armorial devices, orginally concieved as far back as the Crusades in the 11th & 12th centuries as a means of visual identification on the battlefield, have come to bear a greater significance as symbols of shared family heritage and unity. The display of Armorial Coat-of-Arms shows your pride and respect for the heritage, honor and history of your family name. Thousands of surnames are available, many with Official Coats-of-Arms of some of the earliest bearers of your surname. C. COAT-OF-ARMS $15.95 8.5"x11" (shown matted & framed to 11"x14") Heraldic parchment of the earliest know Coat-of-Arms for your surname. Coats-of-Arms date back to the erea of the Crusades in the 11th & 12th centuries when Knights from different European countries joined together to fight side by side for the liberation of Jeruselem and the Holy Lands. They provided indentityl for different royals & noblemen, and their soldiers, on the field of battle. Since those days almost a thousand years ago, many European nobles as well as professionals and businesses have licensed COAs. Proudly display the earliest known COA for your Surname in your home or give it for a very unique and different gift. 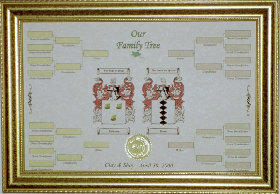 B. SURNAME HISTORY W/O COAT-OF-ARMS $16.95 11"x17" (not shown) Many prefer to leave off the Coat-of-Arms, especially when mounting it next to an Anniversay Bond or Family Tree, both of which already have the Coat-of-Arms on them. The Surname History retains the same information as the Armorial but is illustrated with a beautifully decorated historic border. 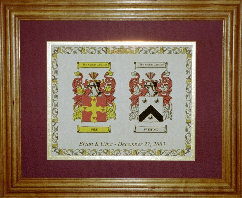 D. ANNIVERSARY or MARRIAGE BOND $21.95 8.5"x11" (shown matted & framed to 11"x14") This magnificent parchment display shows the joy of the union of to proud lineages. Includes Coat-of-Arms for both surnames, typically husband & wife. Frequently purchased to commemorate the special friendship of two people or families. Very popular for Wedding, Anniversary, Christmas gifts or just anytime a special gift is appropriate. Special inscription can be added at bottom, i.e. first names and wedding date. 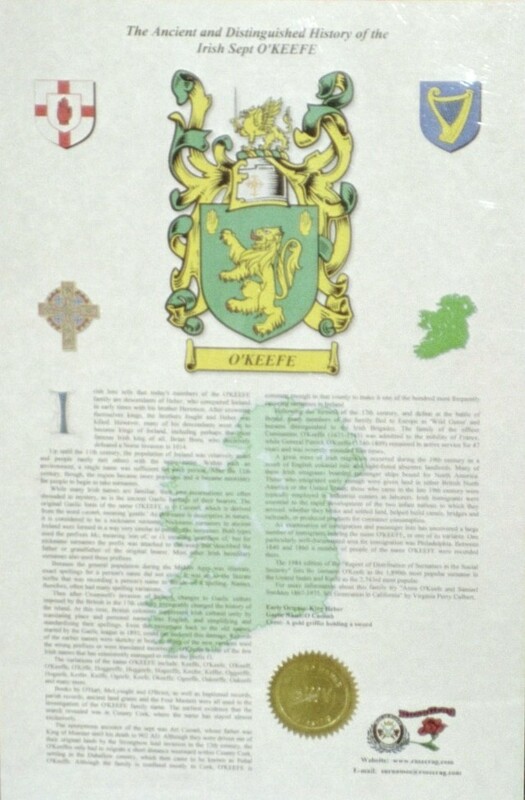 G. IRISH SEPT HISTORY WITH Coat-of-Arms $19.95 11"x17" (shown in a poly-plastic sleeve) Your surname may be one of the old Irish Septs (similar to a Scottish Clan) Show your pride in your lineage with a beautiful 11x17 Parchment print of your Irish Sept. It is also available in the standard Armorial w/COA (Item A above). . You do not have to be member of an Irish Sept organization or society to own and display these prints. F. SCOTTISH CLAN HISTORY WITH CLAN BADGE $19.95 11"x17" (shown in a walnut frame) Your surname links to a Scottish Highland Clan? 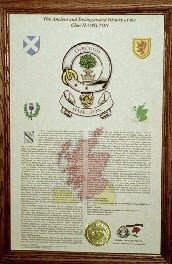 Show your pride in your clan lineage with a beautiful 11x17 Parchment print of your favorite Clan and it's badge. Some have several and display them with pride. 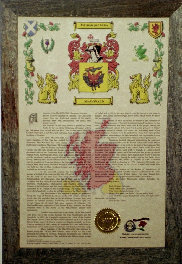 You do not have to be member of a Highland Clan organization or socieity to own and display these prints.